While picking up a Craigslist purchase (watch for this AMAZING transformation coming up) the owner said to take whatever I wanted from her house- after two yard sales and several posts on Craigslist she was ready to get rid of everything. Of course I obliged! I chose this little treasure and a small night stand. She was baffled that out of everything I would pick this (pardon my language) "fugly" plant stand. Little did she know that I had big plans for it as soon as our eyes met. P.S. Notice the clock displayed on top from my Love of Literature post and tutorial. Who would have thought that piece could be so cute! You are good! LOVE IT and I love your blog!!! YOU ARE AMAZING! Really I'm not kiddin..A-MA-ZING! I love it! 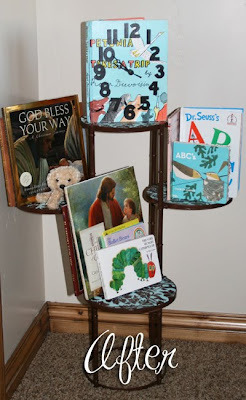 I admire people like you who can see something like that plant stand and transform it into something so amazing! Wow that is WAY creative. :) I myself was thinking, "She could choose anything from the lady's house and she chooses that metal piece of junk?" Well I stand corrected, that is AWESOME. 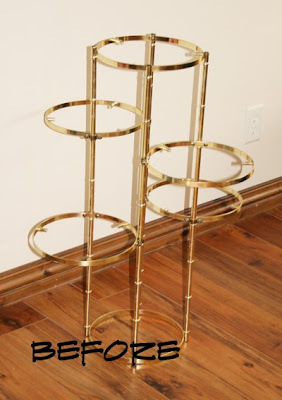 I am now officially on the lookout for a plant stand. Deseret Industries, here I come! That is absolutely adorable! Hopping over from Craft Rookie and am so glad I did! I'm a follower now! You're so creative! GET. OUT! That is too cute. 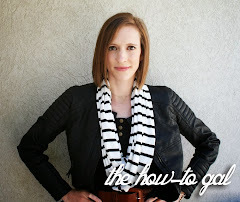 Love your blog How to Gal, I do the very same stuff! I am going to add a button to my blog - come visit me! YOu definitely have a vision - that is so cute.